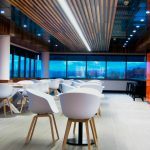 IA Design were engaged by the Department of Immigration and Border Protection (DIBP) to conduct a functional briefing and subsequent design for its new Adelaide workplace. IA Design undertook an extensive briefing process with the DIBP in relation to the multiple uses the space had to accommodate for. The 6 level office space was to service all areas of the DIBP inclusive of customer service, private customer consultations, corporate office spaces and client amenities. The briefing process involved executive consultations, staff focus groups and individual feedback from a range of stakeholders. Following this, the IA Design team workshopped solutions to accommodate the day-to-day needs of all. The focal point of the design was built around the idea of carrying one shape through the space to create a consistent identity. The “triangle” was carried through the ﬂooring, graphics, furniture selections and workstation screens to create a holistic design approach. 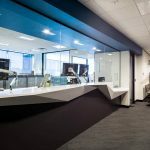 The innovative use of custom made screen dividers not only helped continue this design principal, but created casual meeting points without impacting on the openness of the space. The end result was a highly functional and aesthetic environment that met all brief requirements.